Encoding images as a series of high-level constructs, such as brush strokes or discrete shapes, can often be key to both human and machine understanding. In many cases, however, data is only available in pixel form. We present a method for generating images directly in a high-level domain (e.g. brush strokes), without the need for real pairwise data. 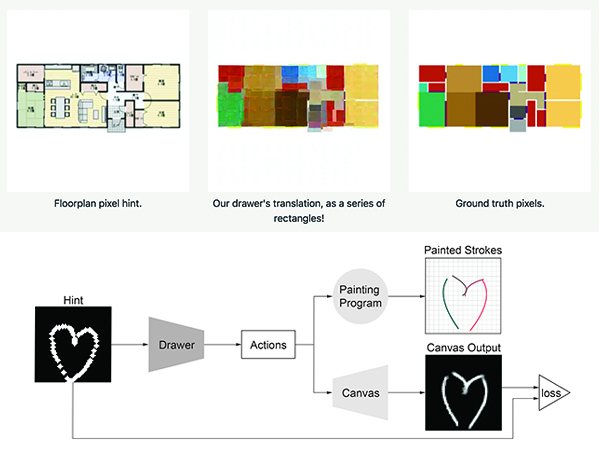 Specifically, we train a ”canvas” network to imitate the mapping of high-level constructs to pixels, followed by a high-level ”drawing” network which is optimized through this mapping towards solving a desired image recreation or translation task. We successfully discover sequential vector representations of symbols, large sketches, and 3D objects, utilizing only pixel data. We display applications of our method in image segmentation, and present several ablation studies comparing various configurations.